OxFSN believes that all people with learning disabilities, even those with the most complex needs, can enjoy a good quality of life. We also believe that, armed with the right information and support, parents and family carers can be powerful advocates for their family member(s). As family carers ourselves we recognise that, while there are many excellent professionals, services and organisations, it is often families who are the constant presence in the life of someone with learning disabilities. Learning disability is life-long, and it is the extended duration of caring responsibilities that sets family carers of people with learning disability apart from other carers. As the majority of people with learning disabilities live with their families, OxFSN specifically supports family carers. We recognise the diverse range of family circumstances and use the terms “family carer” and “family member” to include parents, brothers, sisters, grandparents and extended family, as well as anyone with a parental responsibility such as foster parents. Workshops, events and training opportunities for family carers to learn from and with other family carers and relevant professionals. Support for Older Carers and Families. 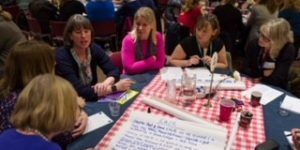 Feedback on the views and needs of family carers to social care providers and the County Council, to ensure that their voices are heard when commissioning services. Telephone and e-mail support and advice. A regular e-bulletin, sent out to hundreds of family carers, organisations and individual professionals across Oxfordshire, with local and national news, information and events.